Directed by Guillermo del Toro and adapted from Mike Mignola’s comic book mini-series Hellboy: Seed of Destruction, Hellboy was released in 2004 to success both financially and critically. Del Toro was a perfect choice to direct due to his flair pertaining to dark fantasy, weird fiction, and practical effects, all of which are implemented in the film to its benefit. Beginning in World War II, Nazis led by Grigori Rasputin (Karel Roden) construct a portal leading to another dimension where Ogdru Jahad, a monstrous entity of some sort, resides. They wish to use its power to destroy the Allies and, of course, take over the world. When the portal is destroyed by Allied troops and the Nazis scattered (Rasputin himself is absorbed into the portal), an infantile demon is left behind, who is adopted by occultist expert Trevor Bruttenholm (John Hurt), and grows into the titular Hellboy (Ron Perlman), a government agent who combats the things that go bump in the night. Things go awry when Rasputin returns sixty years later, bent on fulfilling a prophecy to destroy the world, and Hellboy is forced to work alongside newcomer John Myers (Rupert Evans) and an old flame, Liz Sherman (Selma Blair), to stop him. As previously mentioned, Hellboy is a movie that profits from Del Toro’s dark touch. Practical effects are heavily utilized here to create the fantastic characters. 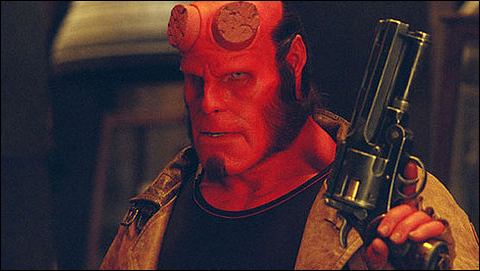 Instead of being entirely computer generated, characters such as Hellboy and the creatures he faces are made of costumes and make-up, utilizing CGI only when necessary for the more complex stunts and action sequences. The two gel surprisingly well, and though the effects are obviously dated by today’s standards, they aren’t distractingly so, and are still commendable. Perlman plays Hellboy quite well. He’s a lovable character due to his “jerk with a heart of gold” personality and comedic wit, but he also has relatable insecurities to him, and a reckless streak that is often an inconvenience, if not lethal, to those around him. It’s a shame that the movie doesn’t explore these flaws and insecurities further than it does, because Hellboy is a character that is fun to watch, no matter the situation. The other characters are memorable too, though some less so than others. Notably Rupert Evans as John Myers, whose presence is explained and obvious (a fish out of water character for the audience, and a piece in the film’s love triangle), but never explore enough to make him interesting. The story has the same issue – interesting on the surface, but could have used more elaboration in certain aspects. Hellboy is a film that stands out from the other derivative films of its genre because it has a style that stands out, and compensates for the substance that it lacks (though do not be confused – it is still there). It is a testament to the fact that style over substance is not always a negative, but nonetheless is often a detriment. Would like to know your thoughts on The Legend of 1900. Sure, I'll get around to that too, thanks.